When I feel like having a light, nut and dairy free smoothie in the morning, I turn to this refreshing pineapple and cucumber combo! The consistency is not thick so you can even enjoy it with your breakfast. My taste buds like the mild sweetness of this smoothie, but if you prefer a bit more sweetness, you can add agave nectar to sweeten it right up. You can also add a small amount of fresh ginger root to open up your senses! Some days, I like to eat more greens, so I substitute the banana for an avocado. This delicious smoothie is cool, light and refreshing! 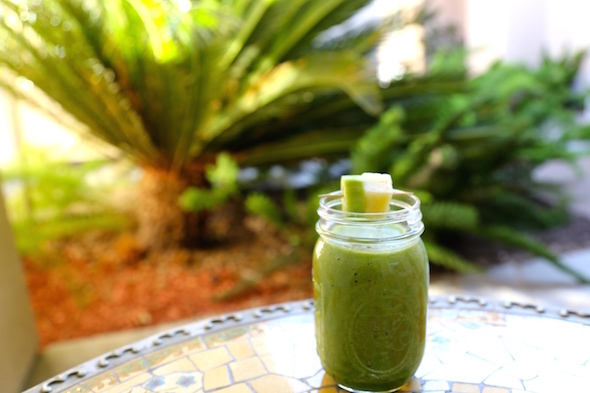 Blend coconut water, pineapple, cucumber, bananas, spinach and ice in a blender until smooth. Add agave nectar for a sweeter taste if preferred.